Who, who….. the snowy owl that’s who! It’s been awhile since I posted so here is a little something about the latest piece I have recently finished. Just a little background about why some things take me longer to finish than others. When I am busy at my regular job and also in life, I tend to start new drawings, illustrations, paintings, or other fine art pieces and then decide to slowly walk away and let the idea of leaving them fester inside me until I give myself a non-committal deadline, if that is what you can call it. I also have a problem with staying on task, which is me self-diagnosing myself with ADHD and using it as an excuse. I jump from one started project to the next and back to another and the cycle goes on and on and on, until I start to pull my slowly whitening hair out. You get the picture. Sooner or later, everything does get done……eventually. So this brings me to explain the “Who” in my blog title this month. 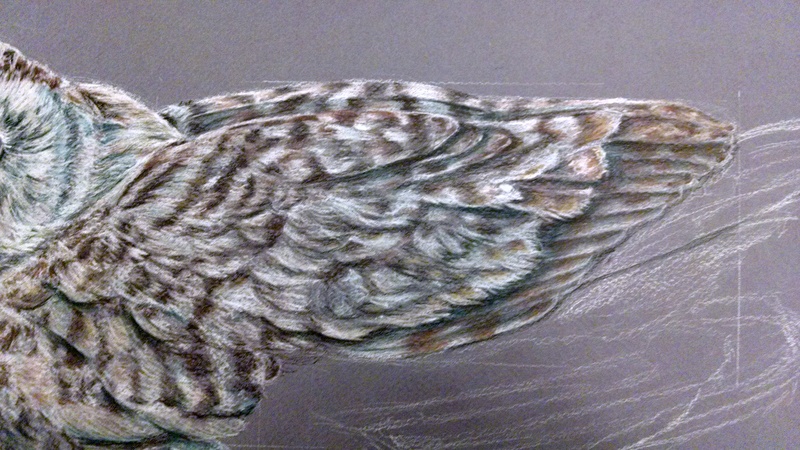 I started an illustration of the snowy owl mount in the bird exhibit hall at the Field Museum about a year ago. I drew the outline one Saturday and then put it back in my portfolio and decided to draw something else. 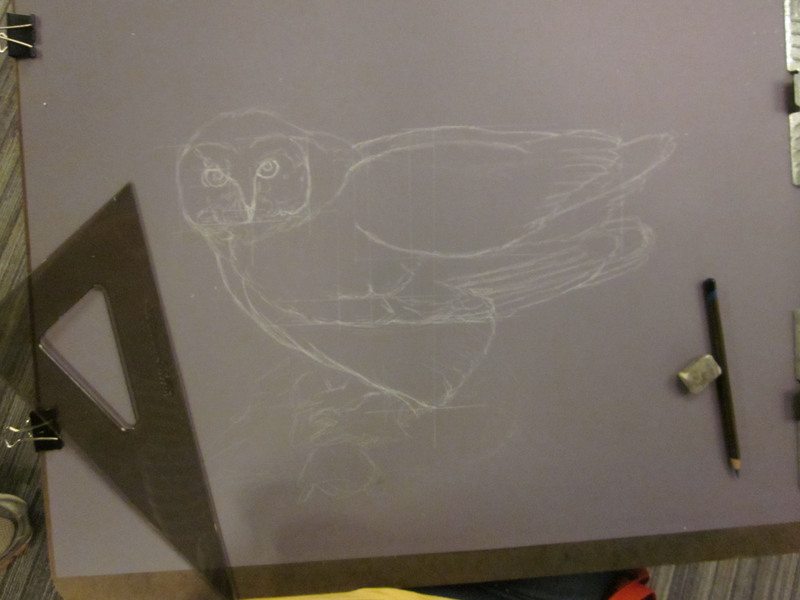 Outline of the Snowy owl illustration. Well, last September I decided to start adding color. 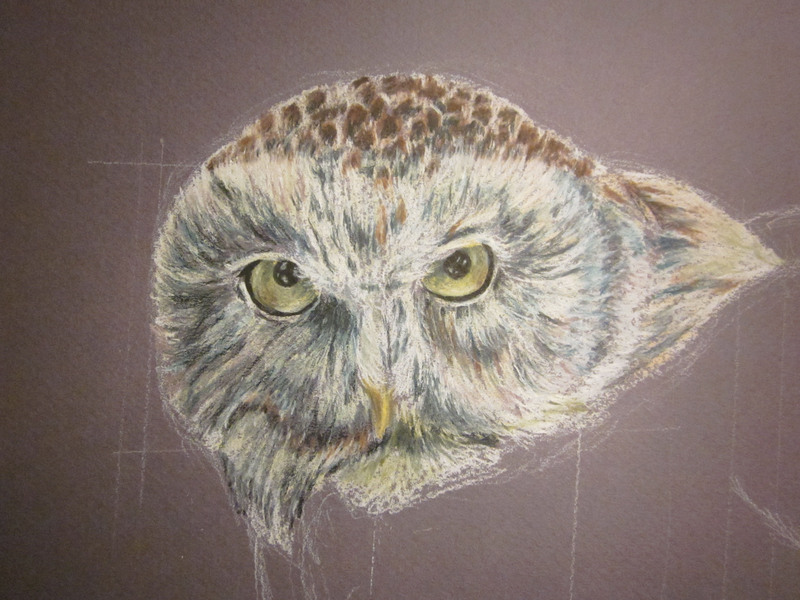 Every Saturday that I met with my one art group called Artist at the field, I worked on this owl. I decided that I wanted to use colored pencils. They are one of those media that I am so comfortable with that I can basically use them in my sleep, plus the fact I have not created anything in colored pencil in a long time, I mean a very long time. 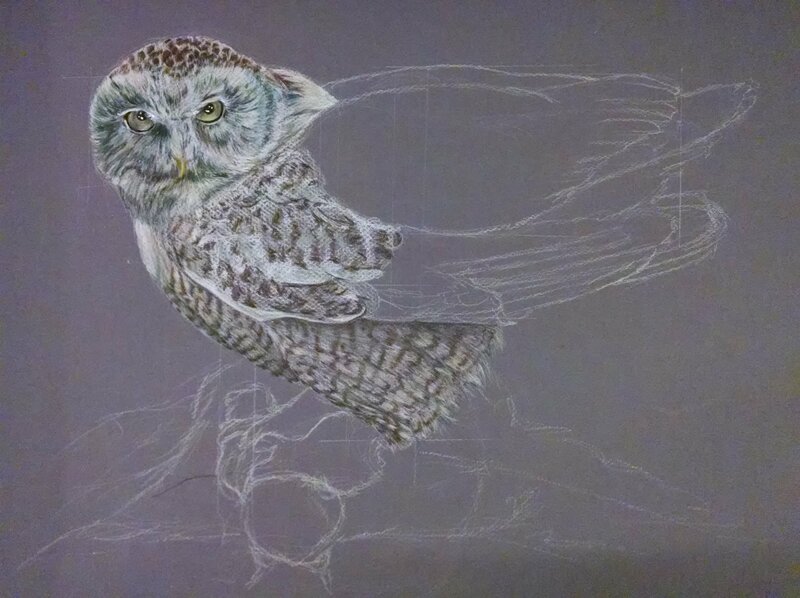 Since the snowy owl doesn’t have too much coloration I opted to use my Derwent drawing pencils. There are AWESOME! 24 colors in the range and they are dull and muted colors perfect for the owl. I LOVE THEM! They are wonderful because they erase with ease just like a graphite pencil. I figured, why not, so slowly I added color. The face was first. A little white here, a little brown there, a little blue here. The muted colors actually worked well on the dark colored paper I picked. I added color as highlights, I added other colors as shadows, but the best part was using the pencils to create the pattern on the wings and back. Ventral plumage and start of the wings. Wing and the feather pattern. The trick is you do not draw out each and every feather. 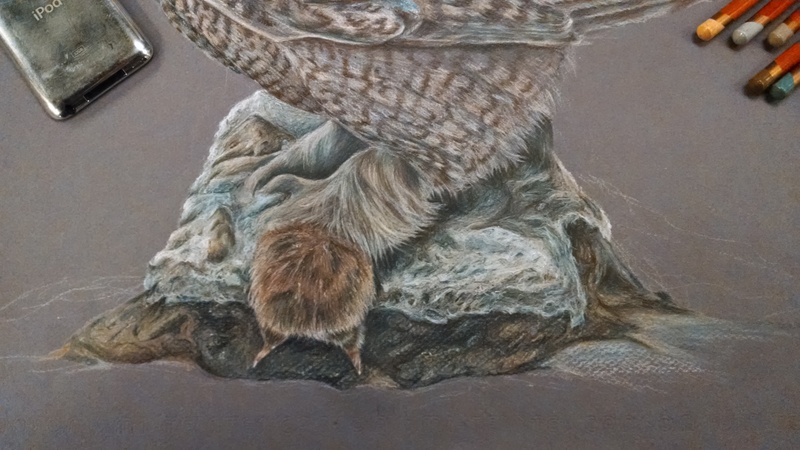 The technique I use is placing color as highlights or shadows where you see it to give the illusion that there are feathers. I also make sure I use pencils that are really sharp. The tip being sharp is very essential to getting the little feathered texture on the wings and underbelly. 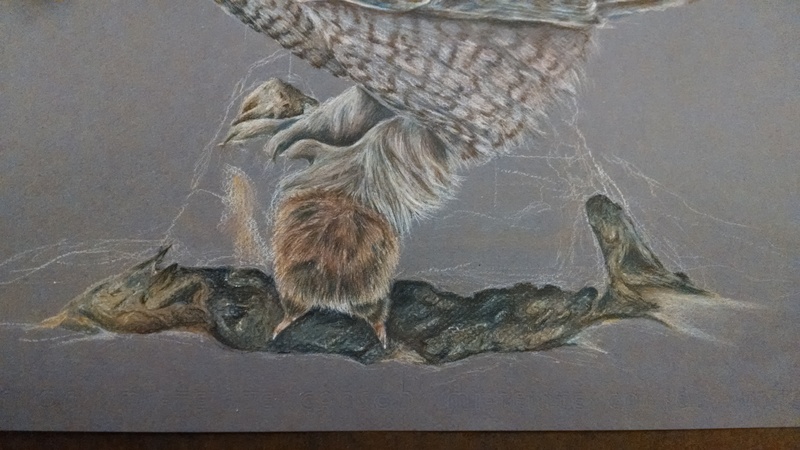 After I had the owl finished, I started on the rodent in the owl’s talons. The poor little guy never had a chance. Oh well. Finishing the rodent was pretty easy, one, it was a small area of the paper, and two, it was nice to actually put strokes of hair on the paper. Once the rodent was finished I started the snow and rock. Rodent finished and starting the rock. The foreshortening and slant of the rock seemed very odd when I drew it at first. Once I started to color it in I noticed that I needed to either add more bumps and pot marks or take away where there were too much texture. All in all, I think I was pretty successful in creating a realistic rock. With that last stroke I was able to put down my pencils and breath a sigh of relief. I had finished one more piece. I was so excited that when my group colleagues came to get me for lunch they saw me jumping around for joy. Yay, I got a little excited. I love that feeling of satisfaction when I finish a piece. What was also nice was when I placed the finished piece in front of the exhibit mount I was drawing, every person passing by stopped to say how beautiful it was. And here is the finished Snowy Owl. 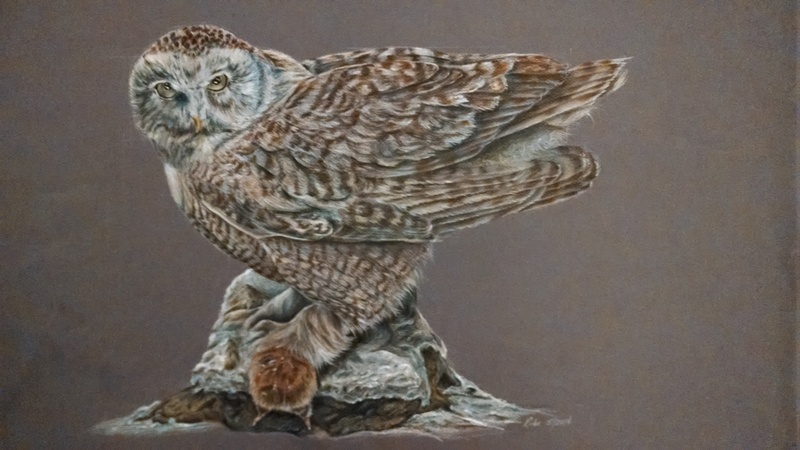 Snowy owl, 2014, Dewent colored drawing pencils on Mi-tients paper, 19×25. Copyright Banasiak Art Gallery and Rebe Banasiak. 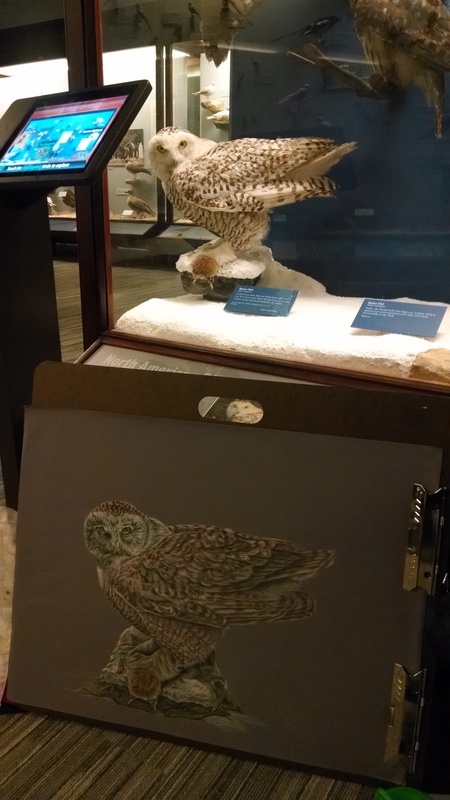 Snowy owl with mount in exhibit case. Rebe, this is really great! I love seeing your step by step and a bit of tutorial too! Did you always work on it on location where the mounted owl was? That’s not easy if you don’t have great light or a good seat! I’ll post your post again on our group on FB (Birds in Art), thanks for sharing!